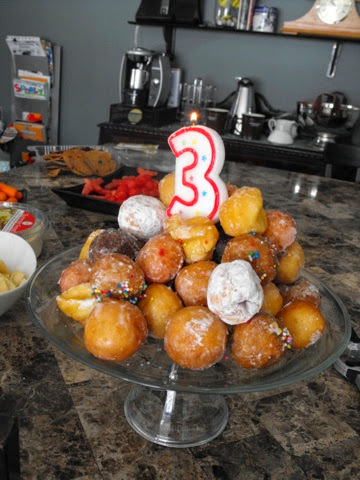 Our middle little dude, whom we affectionately call 'Goose', had this third birthday party today! This was his first 'real' party. At one, they don't really get what's going on, and the fact that they get to have cake for the first time ever is awesome enough for them. At two, they're a bit more clear on the idea that this is something special, and it seems to be about them, but add sparklers on top of that cake and throw in a present or two, and honestly they pretty well max out for their excitement anyway. A few things were quite fortuitous about this choice of party theme. 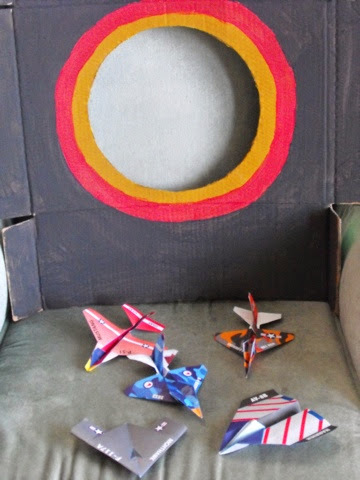 First off - unbeknownst to Goose, I had long wanted to do an airplane theme in his bedroom, but kind of gave up when older brother started hanging hunting posters and archery targets on every inch of empty wall, and ceiling, space. 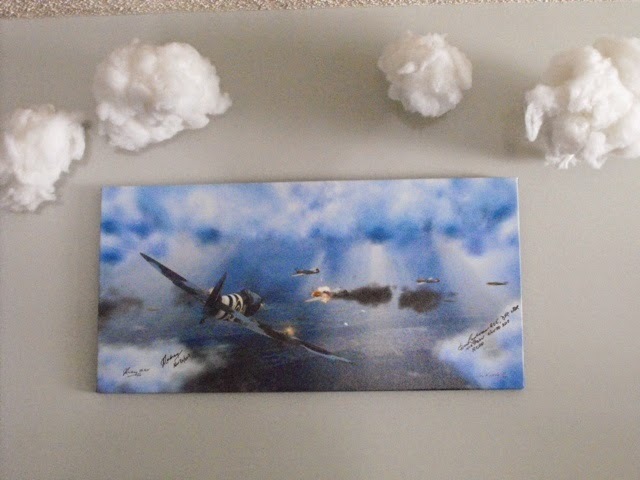 But I had already fashioned some cotton 'clouds' that hang from fishing line. Score. And I had bought him an airplane comforter for his bed that we could use as a backdrop should we need one. Awesome. Secondly - at Easter time, my uncle unloaded on us gifted us with half of the product of his 'Paper Airplane a Day' calendar from the previous year; he made 365 paper airplanes, and sent half of them home with us. We picked out the very best and reserved them for the party, and the rest we let the boys play with for a few weeks before they were crushed enough to justify recycling them. But right there: built in party entertainment! 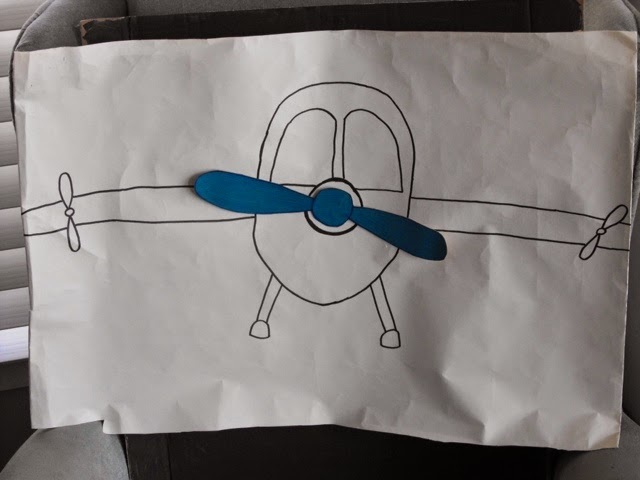 The dollar store was a treasure-trove for this party; we picked up those foam airplanes that come in a flat pack and then you assemble yourself as party favors, a giant one of the same variety to show off to the kids, and an airplane shaped cookie cutter. 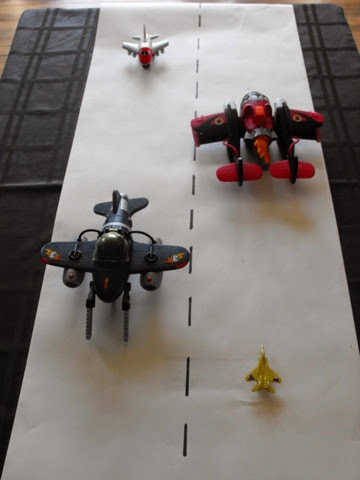 I made a runway on our coffee table for the kids' toy planes to sit on as a party centerpiece, and then used cardboard boxes to make our games: a target practice game, and Pin-the-propeller-on-the-airplane! I even found an airplane book from the library that I borrowed in case the kids wanted a story! Snacks were pretty simple since I was super sick all week and didn't have the energy to prep much: carrot sticks, cucumber slices, and pita chips with hummus, I used the airplane cookie cutter to cut out watermelon pieces, and then I bought a 40 pack of Timbits, stacked them high, and set a candle in the middle for a cake that the kids adored! Lastly, I ordered an Aviator hat from Avon for little Goose, which he proudly wore and got called 'Captain' by everybody. Any excuse to wear a costume in this house! I've said it before: we don't rent out Chuck-E-Cheese. We don't hire petting zoos. We don't have professional planners for our parties, or major excursions for them either, but my kids' birthday parties are fun - for them, their guests, and for mommy - and certainly seem to be the highlight of their year.